The rare Madagascar duck or Meller’s duck (Anas melleri Sclater 1865) is a duck endemic to Madagascar. It belongs to the order of the Anseriforms (Anseriformes), to the family of the Anatids (Anatidae), to the genus Anas and to the species Anas melleri. The name of the genus “Anas” comes from the terms “anas, anatis”, in Latin and simply means “duck”; the species “melleri” is honoured to the Dr. Charles James Meller (1836-1869) British botanist. Monotypic and endemic to Madagascar species. The population is mainly sedentary even if a small part of the same may behave as vagrant. A small population, not very vital, had been introduced in the Mauritius Islands. The species originally frequented all the habitats with permanent humid zones, including the impetuous rivers, from the sea level up to 1550 metres of altitude (Massif Central). The nesting pairs are presently confined, mainly due to the quite ample deforestation of the Massif Central, in the humid woody areas of the eastern coast of the island. In these zones it lives in lakes, rivers, ponds in the wood, swamps and small water streams. It rarely frequents the coastal zones. 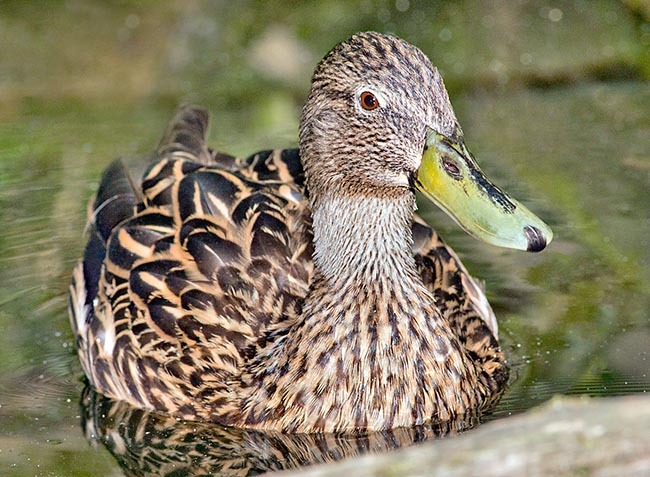 Both sexes of the Madagascar duck, when superficially looked, resemble the females of the Mallard (Anas platyrhynchos). The famous ornithologist Jean Delacour defined this species as “monotonous but interesting”. Actually, the Madagascar duck is bigger and more elongated than the mallard. It has a weight of about 1 kg. 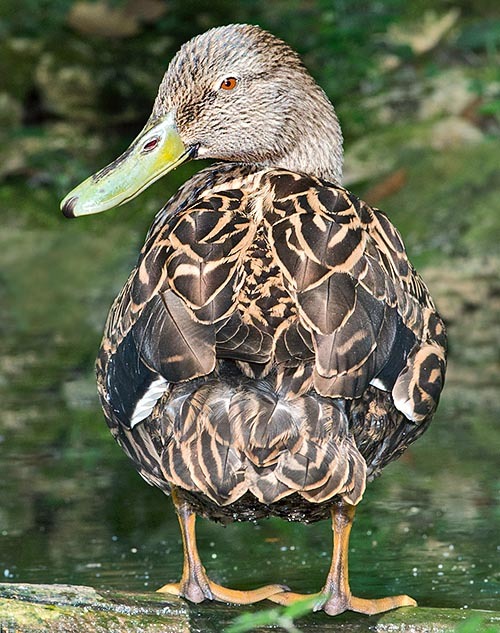 The base colour of the livery is brown-streaked tawny and spotted of dark brown-blackish in more or less way over all the plumage with duller shades in respect to the livery of the females of the mallard; the head is darker (always if compared to that of the female of mallard). The neck is rather thin and the head is distinctly longer than that of the mallards. The bill is big and quite long of a typical dark green colour with grey-dark blue hues. It has an ample speculum of a bright emerald green colour; the speculum has a double border: outer, white and inner one (in contact with the changing portion), black. The legs, webbed, are orange with brownish hues (especially at the level of the nails and the swimming membranes). 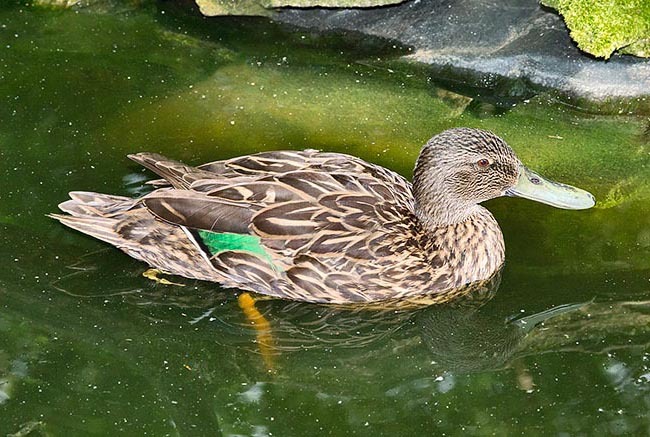 Therefore, upon a not superficial observation, the species is easily distinguishable (from the females of mallard) due to the big bill of different colouration, the livery with the more “smoked” look and the nice speculum changing of green and not of blue. The Madagascar duck is extremely wary and elusive. It flies fast, in a discreet way, often in pair or in small groups of 4-12 specimens. Rarely joins other species during the same flight. The species, on the contrary, can be sighted in mixed groups of different species of birds, during the feeding activity. In the past (in 1989) they have seen even flocks of some hundreds of individuals; on the Lake Alaotra, where was present an overall population of almost 1500 specimens. The Madagascar ducks get the nourishment, during the day as well as in the night, in aquatic habitats of various type (rice fields included), eating aquatic vegetation, seeds, algae, herbs and invertebrates (mainly molluscs). They are aggressive and quarrelsome ducks which may form lasting pair unions. The consolidated pairs are very territorial and the males readily chase away the intruders. The males fight trying to seize the neck of the adversary with the bill, hitting it at the same time with wing beats, and in this way end up in chasing each other in circle. The Madagascar duck reproduces from July to April. It builds voluminous nests of woven grass. It nests mainly along water streams and ponds. The nests are usually hidden in tufts of grass close to the banks. The hatching is formed, as an average, by 5-10 eggs, of yellowish white colour, incubated for about 4 weeks (27-29 days) by the female only. The males may accompany the female with the ducklings but seemingly do not take care of the brooding. The ducklings have a livery similar to that of the ducklings of the mallard. The young are capable to fly after the 9 weeks of age. The species is considered as endangered. The population is dispersed and is declining due to hunting, the anthropic disorder, the introduction of allochthonous predators and of allochthonous competitors belonging to the same genus (mallard) and of the progressive loss of habitat. The situation of the Madagascar duck is dramatic in nature. Some zoological structures, yet too few, breed the species in captivity.